The Bee Laboratory, as well as the Laboratory for Form and Matter, where she experiments with bacteria and “living” textiles, open a framework that has been initiating a wide range of installations, photography works, sculptures, workshops and books. It is a long-term project on the edge of art, science and technology. 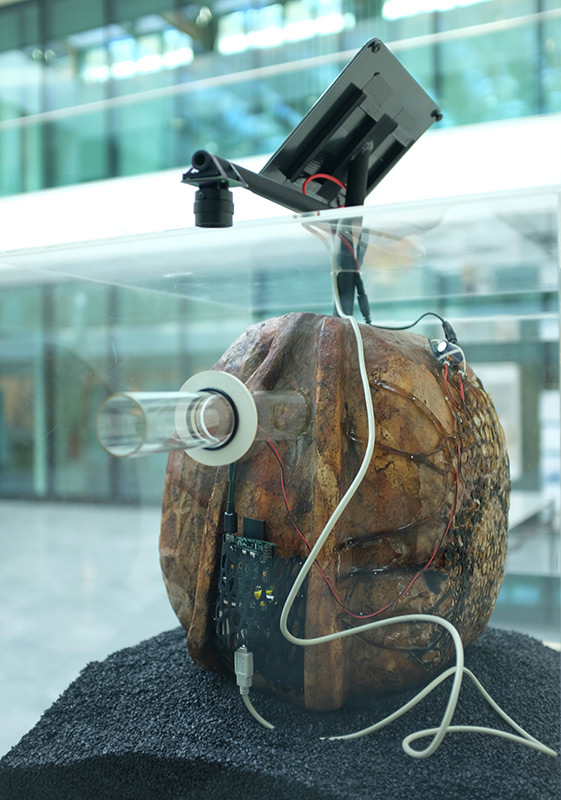 The Intelligent Guerrilla Beehive is a research project on the edge of art and science. It evokes issues of sustainability and biodiversity related to urban environments. Honeybees are bio-indicators. They reflect the health of their surrounding ecosystem as well as the cumulative effects of different pollutants. They are the canaries in the coalmine. To support the disappearing bee colonies, I developed the Intelligent Guerrilla Beehive, a metabolic sculpture with a double goal: at one hand it offers a safe and natural refuge for city honeybees, and at the other hand it reflects the pollution of the environment round the beehive. The Intelligent Guerrilla Beehive project is an ongoing experiment with smart materials and green technology. Honeybees become particle transmitters and bacteria become bioluminiscent sensors. These organisms become interfaces to inform us about the health status of our environment. They become living monitoring technology. This long-term project has been an incredible source of inspiration for artistic research into issues of ecology, architecture and social sustainability of urban environments. The results are giving the public an artistic experience of this ongoing research, related to changing environments.